October 21, 2013 /1 Comment/in Diabetes /by Jenn F.
Tackling obesity is a tall order, but it truly will have a dramatic impact in preventing diabetic foot problems like ulcers. Every day choices have the power to dramatically alter how a person feels on any given day. The makers of the SteriShoe UV shoe sanitizer share their best advice for managing diabetes and keeping the feet as healthy as possible. Ulcers are the biggest concern for diabetics because they can quickly turn into infections and gangrene that cannot be treated by methods other than amputations. Ulcers commonly occur on the ball of the foot or the bottom of the big toe. Occasionally, ill-fitting shoes will cause ulcers on the side of the foot. Health care providers treat ulcers by prescribing antibiotics, scraping away infected tissue and recommending a special shoe or brace to help keep the weight off the ulcer. Even after the wound heals, it is susceptible to future ulcers because scar tissue breaks down easily. The American Diabetes Association says that “Good diabetes control is important,” and that “High blood glucose levels make it hard to fight infection.” Diabetics who do not control their blood sugars usually develop neuropathy / nerve damage and cannot feel skin aberrations as they develop. Furthermore, circulation becomes impaired, so wounds take longer to heal. Knowing what lifestyle factors affect blood glucose levels can help you manage your disease better. – Eat at the same times every day. – Balance meals by always eating protein when you eat carbohydrates. – Use measuring cups to determine portion size. – Coordinate your medication schedule with your meals. – Discuss an exercise plan with your doctor. 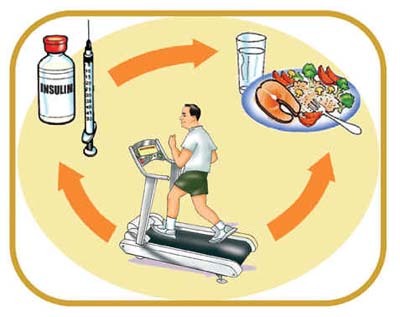 – Always eat a snack or a glucose pill when you exercise. Losing weight can be an effective weapon against diabetic foot problems as well. For type 2 diabetics, studies have shown that just a 5% reduction in body weight had a significant, long-term impact on blood glucose control. To lose weight, the RDA12 nutrition blog recommends eating low-energy-dense foods (like fruits, veggies, whole grains and low-fat dairy) as an effective strategy. One should eat fewer high-energy-dense foods like egg yolks, fats, fried foods, and sweets. Lean meats, poultry, fish, beans, egg whites, and nuts are excellent protein sources for dieters. Another lifestyle factor that matters is foot hygiene. What would you say if someone said, “Hey, I have this sock that has been saturated in sweat, dipped into Petri dishes containing bacteria and fungus, and left to fester for weeks on end… would you like to wear it?” Obviously this is a sock no one wants a part of, right?! Well, why would you put your feet inside a disgusting science project every single day, without giving it a second thought? We wash our clothing, but footwear often slips between the cracks. SteriShoe is the first clinically-proven solution to help you kill microbes in your shoes using germicidal UV light. Keeping bacteria, fungus and other pathogens out of your shoes can help you prevent ulcers, foot fungus, toenail infections and smelly feet. Should You Buy Shoe Deodorizer? Foot Fungus and Fashion: Can You Contract Athlete's Foot from Shoe Shopping? Did You Know Athlete's Foot Is Killing Frogs? this blog is good its very use full to us surgical dressing and after affects and i inform my friend to see your blog… keep posting more blogs.